Written by: KristaG on February 13, 2018. Let’s conjure up a storm with some ancestral magic this Mardi Gras! While last year I focused on finding various games that could conjure up the feeling of being back in The Big Easy, I decided this year I really wanted to focus on one game, in particular, to draw upon the mysticism that permeates the entire atmosphere of New Orleans. Before I begin, though, I do want to make sure to note that while Konja by Pleasant Company Games incorporates some of the ideas (such as the concept of ancestral magic and the use of idols/fetishes) the game has nothing to do with New Orleans culture or Voodoo/Hoodoo itself. However, I still felt it was a fun game, fit my theme fairly well, and would make a good addition to my celebrations and festive foods for this year. Konja is the 3rd game released by Pleasant Company Games and made it’s debut on Kickstarter.com in April of 2017. 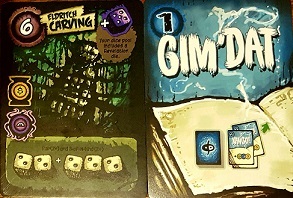 The 2-player dice and card game focuses on push your luck mechanics, was designed by Simon McGregor and features the artwork of Rob van Zyl (who also did the artwork for Ancient Terrible Things). When playing the game, players take on the role of “beardy shaman wizards” trying to conjure clouds to awaken Chango, the ancient God of Storms, to bring rain to the dry desert lands. According to their Kickstarter campaign page and the design notes, Konja was inspired by Aztec, Mayan, and African cultures as well as a blend of religious mythologies. A typical game of Konja takes about 8-12 minutes to set up and 40 play. There are also non-confrontational (“Shayka” variant) and longer game (“Bigga Storm” variant) versions that can be played. Each of the 5 Ancestors grants both a Favor and a Blessing. Depending on which Ancestor a player chooses to call upon, different actions are granted to the active player as well as both players so it is important to choose wisely. The game of Konja is played over a series of turns that consist of 3 phases each. Each wizard/player must complete all 3 phases before the next wizard may take their turn. In the first phase, or “Ancestors” phase, the active player chooses an Idol and places it on the corresponding Ancestor tile. Ancestor tiles are made up of 2 parts: the Favor and the Blessing. By placing the Idol on the tile, the active player receives said ancestor’s Favor, while granting both players the effect of the Blessing. Blessings offer a range of abilities including refreshing Relic cards, drawing new Spell cards, and sacrificing Gold to summon a Cloud. The second phase, or “Bones” phase, is where all of the dice rolling, card playing, and conjuring takes place. The active player rolls the 5 Green dice and the 2 Action dice (small, white d6s). The dice are then used for various actions depending on their color and what faces are rolled. The action dice can be used to activate Relic cards, Spell cards can be cast by spending Magick tokens to reap their benefits, and the Green dice are combined in specific ways in preparation for the final phase, or “Collection” phase, of the turn. Be the first to conjure a minimum of 21 points worth of Cloud Tokens to win! Each token can also be upgraded to be worth more points! During the “Collection” phase, the non-active player has the opportunity to use the Red dice to attack the active player’s dice pool. This is done by spending a Power token and activating their Oodoo Relic to allow them to roll a Red die and use it to replace one of the Green dice in the pool that is of equal or lower value. The active player then gets to spend the dice in their pool at the Pyramid of Summoning where they can receive more resource tokens or Cloud tokens. Any unused Action dice showing a resource icon will also award the active player with that resource at the end of the “Collection” phase. 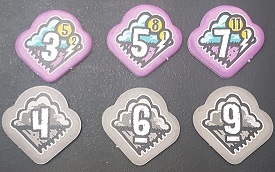 Player’s alternate turns in this fashion until a player summons at least 21 points (unless playing the “Bigga Storm” variant) worth of Cloud tokens and awakens Chango. The game ends after both players have taken their final turn for the round. Both players then total up their points and the wizard with the most points wins. To be perfectly honest, there were a lot of things that I liked about the rule book and a lot of things that I did not. Even after reading through it several times and having my Player 2 read it after me to try and find answers to my questions, I still kept feeling like I was missing something. 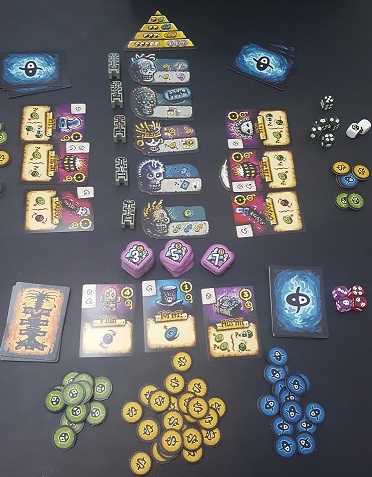 Though things are well explained and there are tons of colorful images to help with details, I feel it is a little jumbled with the organization and certain things just fell through the cracks with the final edition of the rules. However, there is thankfully a “How to Play” video on their Kickstarter campaign page that helped me tremendously! On the flip side of that, though, once you have learned the game, it is incredibly easy to not only play but to teach others! The artwork of Ancient Terrible Things compared to the artwork of Konja. Speaking of the images of the game, they are all very stylized and done very similarly to the gritty feeling artwork for Pleasant Company Games’ previous title: Ancient Terrible Things. 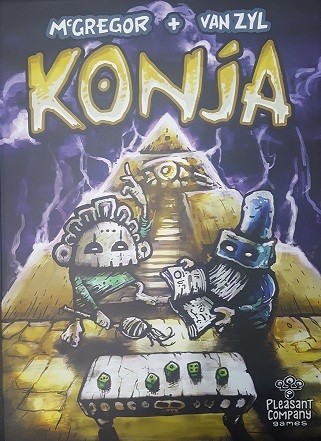 Much like with Ancient Terrible Things, the art used in Konja sucked me right into the game and I knew immediately it was a must have for my collection. The premise that the mechanics used in Konja not only featured many of the core elements from the DiceQuest system designed by Simon McGregor, but also streamlined quite a few things from their prior releases certainly also piqued my interest (the spawning of an “upgrade kit” for Ancient Terrible Things to the new system may or may not have also helped with this). I really like the changes that were made to the original system for this game since it makes it very different from the others and isn’t just a simple re-skin of a new theme and smaller player count! I also really like the inclusion of the custom d6s with the skull pips! 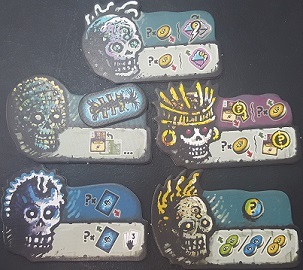 Even though the change from regular pips to skulls seems really minor, it really does add to the mysticism and nods to the “throwing of the bones” concept. Overall, I am thrilled with this purchase and am glad I get to include it in my Mardi Gras festivities this year. The theme is well executed and done in a way that I felt was still respectful to the religions and cultures that inspired it; especially when compared to other games that focus more on it being more of a “New Age” trend with some entertainment value. As there is very little reading involved in the game, I feel this is a game that can easily be played with children and adults alike so it makes a great addition to our collection for father/daughter time when our Player 3 is in town or a game night with just us adults. Wishing everyone a fantastic Fat Tuesday and, as they say in the Crescent City, laissez les bon temps rouler!